Who doesn’t love getting a bouquet for their birthday?! There’s nothing quite like burying your nose in a colorful array of fresh flowers. They sit as a bright notice that someone was thinking about you, especially on your big day. Most gift-givers, however, want to give something that will make an impression and last a long time. If it can be sent over together as a surprise? Even better! 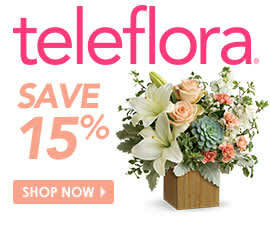 Teleflora’s Fun ‘n Festive Bouquet combines the best of both in the gift-giving world. This display is bursting with fresh chrysanthemums resting in a keepsake mug that the recipient can enjoy every single day, all year long. It’s perfect for coffee-lovers or tea aficionados, or anyone who enjoys the occasional beverage of any sort. Her up-close photography shows off her bouquet and keepsake mug on a sunny day at home. We love seeing how people use our products in their everyday lives. We often see bouquets in the office or sitting on the table for a loved one’s dinner, but we don’t see a bouquet placed outside every day. It’s refreshing! Even if the sun weren’t out, though, this delivery would brighten up any room. Check out more of Ashley’s thoughts – and learn about her family’s upcoming celebration – over at Surf & Sunshine.